When Julianna and Doug came to us for Custom Handcarved Wedding Rings Owen was very pleased to be able to make them for their Wedding. Julianna wanted the Sterling Silver Raven and the Sun with the Sun being 14kt Red Gold making it so pretty. The Northwest Coast Native myth is about Raven being a sneaky trickster who steals the Sun from the Grandfather Creator and leaping through the smoke hole tossing the Sun ball into the sky. The bigger story is on our Transforming Raven Bracelet page. 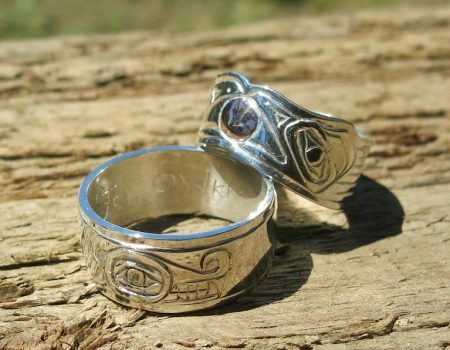 Doug has a beautiful Sisiutl tattoo that he likes and wanted on his carved Wedding Ring. Owen made it a substantial band that is slightly curved for comfort. The Sisiutl is a mythological creature associated with lightening and wealth. If you can communicate with a Sisiutl you can gain the secret to wealth – if he doesn’t eat you first! Thank you, Julianna and Doug, for letting Walker Goldsmiths be involved with the wonderful occasion of your marriage. Custom Handcarved Wedding Rings are fun to make and it’s always nice to meet new friends and hear their stories.